When it comes to all-inclusive Caribbean getaways, there are plenty of options – and mediocre experiences. Discerning travelers staying at the Sandals Grande Antigua Resort & Spa, a couples-only retreat on Dickenson Bay, have a few things going for them, like access to the isle’s longest stretch of white-sand beach. Located just 15 minutes from the V.C. Bird International Airport, the 373-room resort is split into two parts: The lush Caribbean Grove and the European-inspired Mediterranean Village. Built in 2007, the Mediterranean section has some of the resort’s best perks, including the largest pool in the eastern Caribbean – complete with private cabanas decked out with misting machines and personal attendants ($99 per day) – and a suite of new plunge pool villas overseen by English-trained butlers. Couples hankering for adventure can head to Island Routes, the resort’s on-site tour operator in St. Mark’s Square. The mantra here: Match guests with born-and-bred locals with a passion for all things Antiguan, whether it’s deep sea angling for barracuda or sailing power catamaran-style for neighboring Barbuda, home base for the largest colony of frigate birds on the planet. In the Caribbean, it goes without saying that sunsets are big events, but they have special meaning at this Antiguan resort. 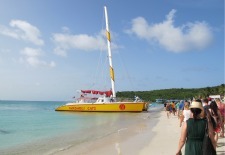 For prime horizon views, dine at the resort’s tuck-your-toes-in-the-sand Barefoot by the Sea restaurant or book a sunset cruise aboard the 66-foot Spirit of Antigua, which plies past tiny islands inhabited by cliff-clinging goats and key ports along the coast. It was on a patch of coast in front of the resort that an Antiguan maiden named Gisele once pined for her Spanish adventurer, Ricardo, to return from a years-long trip at sea. To celebrate their love story, a bell in the resort’s tower tolls each night after sunset, just as the moon starts its ascent. Through September 29, 2011, guests who book a seven-night stay receive up to 65 percent off – and one night free in select suite categories – for travel through December 27, 2012 (blackout dates apply). See our Antigua Travel Guide for more trip-planning information, then use our Travel Search price comparison tool to find the lowest rates on flights, hotels, packages, and more travel deals.